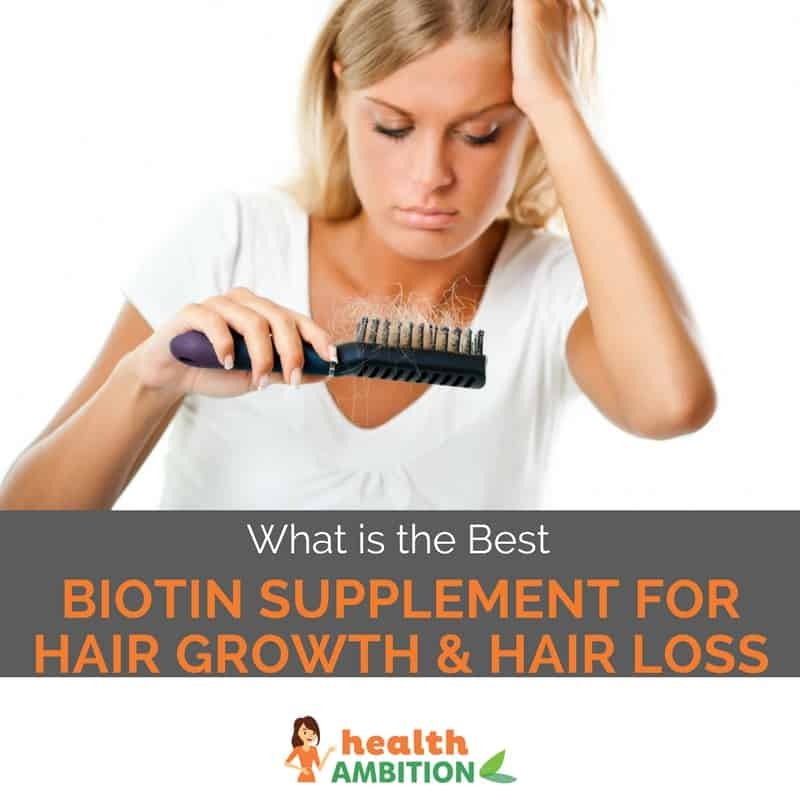 What Is the Best Biotin Supplement for Hair Growth & Hair Loss in 2019? Hair loss is, unfortunately, an inevitable aspect of aging. However, this doesn’t mean you can forget about nourishing your hair until you reach a certain age. Regardless of age, your hair may be naturally thin or suddenly lose volume due to certain illnesses or medication side effects. That’s where biotin supplements come in. You’ve probably heard about biotin. It has quickly become one of the most popular supplements for hair growth and hair loss in recent years. But is it all hype or can a tiny pill really restore those thick, luscious locks in a matter of months (or even weeks)? In this article, I’ll explain exactly how biotin supplements work and who can benefit from taking them. I’ll also be reviewing some of the best biotin supplements currently on the market and sharing my personal favorite product at the end. A 5-month supply of biotin that can improve hair growth, skin condition and strengthen nails. No fillers. Designed with a rapid release formula to ensure the biotin is absorbed fast. Softgels for easy ingestion. Formulated for women, this supplement includes important B-vitamins known to improve hair, skin and nail health. A socially-aware product that provides a bottle of vitamins to a child in need with every purchase. Strong dosage. Claims to be the only non-GMO certified biotin softgel. A dosage of 5000 mcg is combined with coconut oil. Biotin is also known as vitamin B7. It’s sometimes referred to as “vitamin H”, which comes from the German words, Haar and Haut, meaning ‘hair and skin’. You may have seen biotin listed as an ingredient in various beauty products. Biotin is not well absorbed through the skin so lotions and other topical treatments are not very effective. This is why you should consider taking an oral biotin supplement instead. You may benefit from a biotin supplement if you experience any of these symptoms, especially brittle hair or hair loss. (source) Your doctor can quickly and easily diagnose biotin deficiency with a blood test. Even if you don’t have a biotin deficiency, you may experience hair loss or hair thinning naturally as you age. Changes in hair quality can also occur during pregnancy or if you are consistently stressed out. (source) Biotin supplements are also useful for those unlucky folks among us who are victims of hereditary hair loss. You may also experience hair loss if you are affected by certain disorders, such as anemia (low iron) or thyroid disorders (either hypothyroidism or hypothyroidism). Hair can also become thin due to excessive use of harsh treatments such as straightening, blow drying or dying. Finally, when taking certain medications (such as immunosuppressants, acne medications or antidepressants), hair loss can be a side effect. In all of these cases, a biotin supplement may be able to help. What Do Biotin Supplements Do? 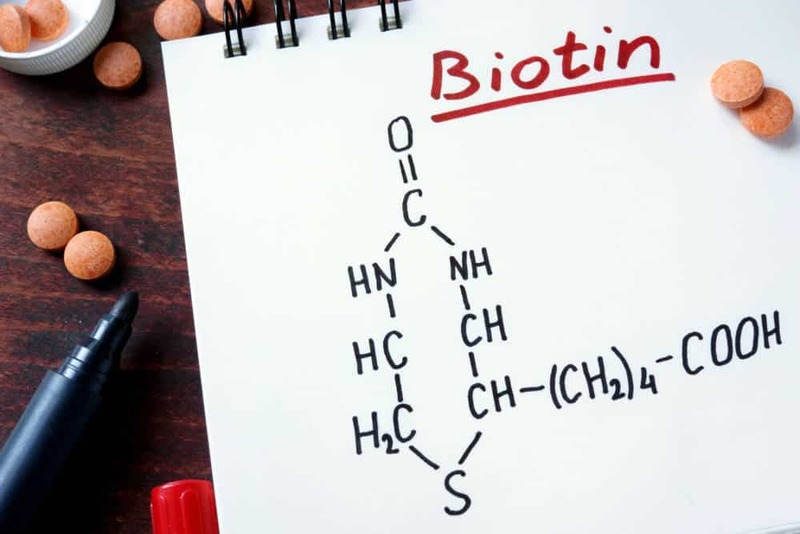 Biotin plays a crucial role in the metabolism of carbohydrates, fats and proteins. (source) We are interested in what it does for hair, though. So, how exactly does biotin help hair growth? Is it actually legitimate or another hyped up hair treatment? First let’s review some basic facts. As you may remember from science class, your hair is made up of the protein, keratin. Amino acids are the building blocks of proteins, but something needs to set off a chain reaction in order to start the building process. When it comes to keratin, biotin is that special something. It reacts with cell enzymes and produces the amino acids necessary for constructing keratin. (source) So, taking a biotin supplement will allow your hair to grow as fast and thick as it possibly could. There are countless biotin supplements on the market, making it difficult to find the best biotin supplement for you. What should you look out for? Take a look at this handy list. As with anything you’re going to put into your body, quality is king. You should avoid biotin supplements with unnecessary or synthetic ingredients. Many of these ingredients may not have been tested for their efficacy and you may be be diluting the quantity of biotin with every added ingredient. There’s no doubt we all want to be safe when using nutritional supplements. In fact, safety and quality go hand-in-hand. So, when choosing a biotin supplement, look for one that is manufactured in a facility which is certified under good manufacturing practices (GMP) or approved by the FDA. If you have allergies, you’ll want to make sure the supplement is allergen-free, too. Though a supplement’s ingredient list may not contain a particular allergen, the supplement may potentially be contaminated if the company’s facilities deals with other products containing the allergen. Finally, you should consider the dosage provided per serving. Does the supplement contain enough biotin to do what you need it to do? Biotin supplements for hair growth typically have a dosage of 5,000 to 10,000 mcg. However, some people may find that 10,000 mcg is a bit too much for them. If you are vegetarian, you will want to check the label to see if the product is vegetarian-friendly. Many brands use a gelatin capsule from an animal source, which is sometimes unexpected. Pectin is a plant-derived alternative. You may also be wondering what the side effects of biotin are. Well, there are virtually no side effects because biotin is a water-soluble vitamin. This means that your body will get rid of any excess amounts. And remember, as is the case when starting any other supplement, it’s recommended that you speak to your doctor or pharmacist before taking a biotin supplement. This is especially important if you take a regular prescription medicine or have an ongoing health condition. 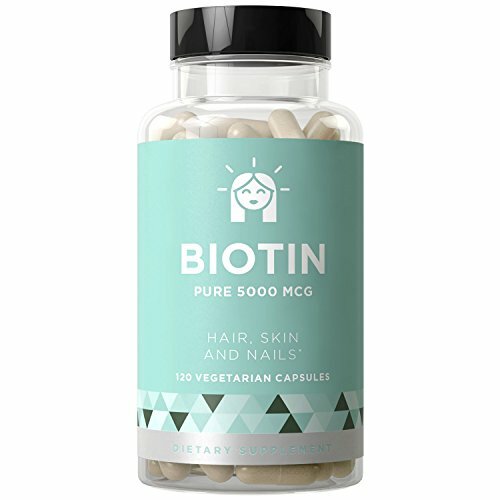 Now that you understand what to look for in a biotin supplement and more importantly why, I’m going to review five of the most popular options on the market at the moment. I’ve listed the major pros and cons so you can compare brands easily. Hopefully, my reviews will help you make an informed decision. 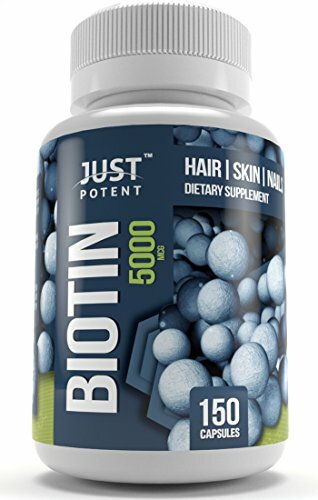 This biotin supplement by Just Potent, contains 150 capsules containing 5000mcg of biotin for a decent price. It is also vegan-friendly, non-GMO and gluten-free. The pills are small and easy to swallow, which is good news. The supplement is also made in a GMP-compliant facility. This gives me peace of mind in knowing that the supplement I am receiving is safe. This one is different from the other supplements I have reviewed so far as it contains 400 mg of vitamin C. As you may know, vitamin C is good for the immune system. You may not have known that it also has benefits for your hair. Users say this biotin supplement prevents further hair loss and makes their hair grow faster. The only complaint is that it causes breakouts in some users (though not as much as the previous supplement I reviewed which contained coconut oil). You can count on Nature’s Bounty to deliver the highest doses possible. In this case, they offer 120 10,000mcg biotin capsules. Although biotin is excreted out of the body if there’s an excess, it’s still possible to take too much. Taking large amounts for a long period of time may cause an adverse reaction. Indeed, some users have experienced that with this supplement, as it caused them to breakout. So, unless a high-dosage supplement is recommended by your doctor, this supplement may be too much. Otherwise, it is a decent brand, which meets GMP standards and does not use artificial colors or flavors. The price of Nature’s Bounty biotin supplement is great, but you may not want to take the risk here. Natrol also offers a high dosage supplement, containing 10,000mcg biotin pills. In this case, though, there are two bottles (each containing 100 tablets). Many users praise this supplement for making their hair thicker within two weeks. Once again, a few people did complain about it causing an unwanted reaction, such as a rash. This is likely due to the high dosage provided. If you would like to avoid an unwanted reaction, you should take a lower dosage, at least to start with. 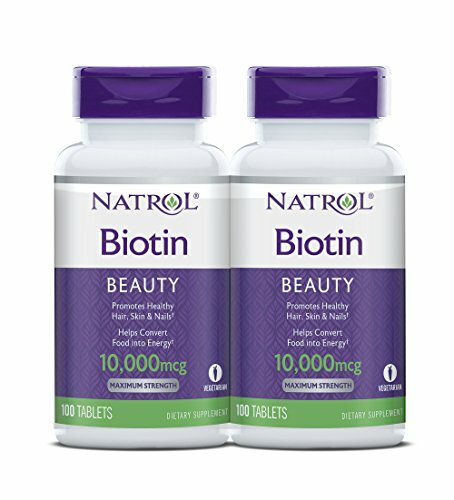 Natrol also offers biotin supplements in 1000 and 5000 mcg doses. Calcium is an added ingredient in this biotin supplement, which is a good thing since it does play a role in hair growth. Calcium helps with the secretion of hormones such as androgens, which promote hair growth. It also helps with the secretion of biotin. Regardless, it is one of the most popular biotin supplements. I think the low price is definitely a contributing factor to this. This supplement from Eu Natural offers 120 vegetarian capsules containing 5000mcg of biotin. Eu Natural’s biotin supplement is very high quality, being gluten-free and processed in an FDA-approved facility. The pills are soft and easy to swallow (which is great because I have a hard time swallowing big pills). It even comes with a money-back guarantee, so you don’t need to worry about wasting your money on something that doesn’t work. Users have overwhelmingly positive things to say about this biotin supplement. Many claim it has helped with their hair growth (allowing their hair to grow back stronger, shinier and thicker). The only thing I am disappointed about is that the company claims the supplement has no fillers, but the current formula does contain rice flour. Although it’s harmless, I prefer to keep things simple and filler free when it comes to supplements. Sports Research also sells 120 vegetarian capsules containing 5000mcg of biotin. They are non-GMO, gluten-free and stearate-free. As with the previous supplement, this one is a softgel, which is easy to swallow. What makes it different, though, is that it contains organic, cold-pressed coconut oil for better absorption. While this may be an attractive feature to some people, others may see it as a problem (specifically those with tree nut allergies, who cannot use it). Users say this supplement makes their hair grow faster, but some complain that they have had acne breakouts (especially those with oily skin). These biotin supplements were all very close in terms of ratings, making it tough to pick just one as the winner. In my opinion, out of the five supplements reviewed, the best biotin supplement is Just Potent’s 5000mcg supplement. First of all, I think 5,000 mcg is a safe amount of biotin to ingest. It does cause some people to break out (as many biotin supplements do), but not the majority. It also works well for the purpose of preventing hair loss and stimulating hair growth. On top of that, Just Potent’s biotin supplement formula contains ingredients with antioxidant properties, which protect against grey hair and hair loss. There are no fillers in this product, so I know I am really getting what I paid for. I like that Just Potent is a high-quality company, too. Their supplement is verified non-GMO and processed in a GMP-compliant facility. This means you don’t need to worry about it being unsafe or low in quality. I am so glad this product is stearate-free, yet easy to swallow and seems to work very well. The price is also pretty good, so you don’t need to feel as though you’re spending a fortune just to get your hair back! For all of these reasons, Just Potent is my top pick for biotin supplements. What Is the Best Vitamin Stack for Hair and Nails Growth?